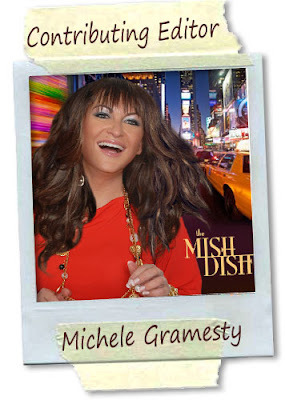 Hello everyone, I would like to introduce to you our contributing editor Michele Gramesty who is an amazing jewelry designer and a fashion insider at New York City. She had lend her design talent to various of famous design houses such as Halston, Ralph Lauren, Carolee Jewelry..... just to name a few! Today she would like to share with how you can dress up your shoes with a touch of sparkle & update your look! 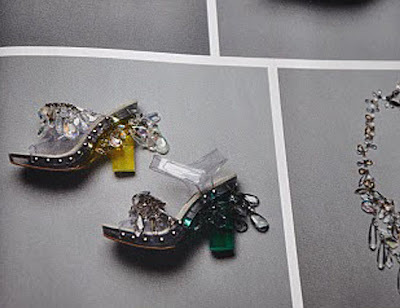 I have been quite intrigued by the Prada plastic shoe with jewels since they strutted down the spring 2010 runway show, having said that I would never wear plastic shoes.. This Prada collection of shoes served as great inspiration for more shoe jewelry, ankle adornment and chic shackles designed by Mish. If you are interested in ordering a custom pair of Swarovski crystal shoe jewelry email me at TheMishDish@gmail.com our store should be up and running very shortly so please stay tuned.